Who knew, back in 1999, that a little movie starring declining actor Keanu Reeves (I remember thinking the trailers for this film and Reeves� presence made it look like another Johnny Mnemonic), would turn into an instant classic that would spawn a pair of sequels so highly anticipated that they were shot back-to-back. The Matrix truly was a box office smash that seemingly came out of nowhere, made household names out of The Wachowski Brothers, and vaulted Reeves to a superstardom that he had only dreamed about, even back in his Bill & Ted days. It took four years, but in the summer of 2003, the first of the two simultaneously filmed sequels , The Matrix Reloaded, was released in theaters, and took it in even more money than the original. Despite a general consensus that, while it was good to see the original cast reunited among a bigger budget and more spectacular special effects, the new film wasn�t as good as the original, fans still wanted more. The movie�s cliffhanger ending and tacked on trailer for the third movie led to even more anticipation for the close of the trilogy. Fortunately, fans only had to wait until the holiday season of the same year, when The Matrix Revolutions bowed. However, the inferiority of the first sequel to the original hadn�t sat very well for the trilogy�s rabid fans, and the third sequel barely broke the $100 million mark at the box office and was blasted by critics. Watched on their own, nearly 10 years after the first film�s premiere just isn�t the same as taking in the trilogy as a whole. Therein lies one of the many benefits of Warner�s new Blu-ray release, The Ultimate Matrix Collection, an amazing box set that not only compiles the first three movies, but also includes the direct-to-video release, The Animatrix and even includes another pair of discs chronicling the making of the trilogy called The Matrix Experience. For anyone who is even a casual fan of the franchise, and for everyone who owns a Blu-ray player, this set will easily challenge The Godfather box set for best Blu-ray release of the year. In The Matrix, we meet Thomas Anderson (Reeves), a career software developer who moonlights as a hacker named Neo. He then meets a strange, leather-clad woman named Trinity (Carrie-Anne Moss) who introduces him to the even weirder Morpheus (Laurence Fishburne). This pair informs Neo that the world he knows is not the real one, and that computers have actually taken over and are ruling all of mankind. Morpheus believes that Neo is a savior that has been called upon to defeat the computers, but in order to get to their �leader� he has to first go through Agent Smith (Hugo Weaving), which proves to be a tall order. This first film is more than deserving of its instant classic moniker, but things get a little hairy when we get to the much-anticipated first sequel, The Matrix Reloaded. We learn early on that Neo has been doing more and more to resemble the savior that Morpheus still believes he is, but the denizens of Zion think that taking military action if the only way to defeat the machines. Adding to the story is the burgeoning love affair between Neo and Trinity, and the former�s first visit to the Oracle (Gloria Foster), which sets in motion a series of confusing plot elements that almost single-handedly turned many of the films� fans off from the rest of the proceedings. We�re left scratching our heads for much of the remainder of the second film after the Oracle is introduced, but it�s still difficult to fault a movie that has such an amazing final highway chase sequence and engaging cliff-hanger ending. It�s with the third film, The Matrix Revolutions, that we realize just how much the Wachowskis have lost their way. We pick up with the resolution to the cliff-hanger ending, and Neo is stuck in limbo between the real world and the Matrix. Trinity and Morpheus are trying to save him, but have to visit the Merovingian (Lambert Wilson) and his wife, Persephone (Monica Belluci) for some help. Unfortunately, this is about as linear and coherent as the movie gets, with the rest of the film jumping all over the place. The Neo in limbo sequences are a prime example, as we see him stuck in what appears to be a subway station, yet when he finally escapes, we�re left with an empty, unresolved feeling about this subplot. The ending also leaves us feeling a bit empty, especially when we�re discussing the finale of a blockbuster, landmark science fiction movie trilogy. Still, it�s difficult to argue that this is a franchise that will go down in cinematic history as an extremely important, revolutionary one, and there�s no better way to revisit it for years to come than The Ultimate Matrix Collection on Blu-ray. Image Transfer Review: All three films are presented in their original 2.40:1 widescreen aspect ratios, and look a great deal better than they have on previous DVD releases. The images are exquisitely detailed, with such minute features as facial hairs and skin blemishes appearing as clean as clear as they ever have. The trilogy�s overall color scheme was never overly bright and vivid to begin with, but we do get some bold colors from time to time, with the abundant greens appearing true and accurate. While there�s a slight bit of dirt and grain during the first film, the two sequels are completely blemish-free. Audio Transfer Review: While there are many audio options here, including some 5.1 and 2.0 tracks, the only way to get the full effect from these films on Blu-ray is by listening to the Dolby TruHD 5.1 mix. While the dialogue-heavy sequences in all three movies do offer crystal clear dialogue, they�re rather subdued, as far as the overall mix goes. However, when it comes to the action sequences, the entire sound field opens up like never before. The best, most dynamic sequence in the entire trilogy is the chase sequence at the end of the second movie. The blend of aggressive, heart-pounding bass, immersive surround usage, and simply exciting sound effects makes this disc a great way to show off the power of Blu-ray. For The Matrix, we get a pair of trailers and eight TV spots, followed by a pair of commentaries that offer opposing viewpoints on the film. The first, is a �Philosophers Commentary� with Dr. Cornell West, Professor of Religion and African American Studies at Princeton University and author Ken Wilber. They give us an interesting view of the movie�s themes, while another track, a �Critics Commentary� with Todd McCarthy, John Powers, and David Thomson, focuses more on the movie itself. There�s also a written introduction by The Wachowski Brothers, during which they talk about these commentaries. On this same disc, we not only get a cast & crew commentary by Carrie-Anne Moss, Zach Staenberg, and John Gaeta, but also another one with composer Don Davis, which is also a music-only track. Then, we get to the �In-Movie Experience� which allows us to watch the film with a series of behind-the-scenes clips popping up on the screen while the film is playing. If you�d rather have your making-of footage after the movie, you can start with the two-hour-plus documentary, The Matrix Revisited, which will tell you everything you needed to know about the film and then some. Behind the Matrix is another documentary, this time detailing even more on-set occurrences for 42 minutes, while the 23-minute Follow The White Rabbit, and 17-minute Take the Red Pill, offer up even more candid footage. There�s also an �Audio� section including The Music Revisited, which allows us to choose from 41 tracks of music from the movie to listen to. Rounding things out is the music video for �Rock is Dead� by Marilyn Manson. The extras for The Matrix Reloaded include another pair of commentaries, along with another written introduction by The Wachowski Brothers. Both commentary tracks feature the same participants as we heard in the �Critics Commentary� and �Philosophers Commentary� for the first film. There�s also another �In-Movie Experience� that can be turned on or off at any time during the movie. We get more trailers, this time in the form of a Reloaded/Revolutions Teaser, the trailer for The Matrix Reloaded, and eight TV Spots. Behind The Matrix is a 46-minute documentary that isn�t quite as informative as the similar feature for the first film, but is still worth a look. There�s a long, nearly 90-minute documentary on this movie�s main set piece, the Car Chase, a seven-minute look at the Teahouse Fight, and 40-minutes of behind-the-scenes footage that give us an Unplugged look at the Neo Vs. the Agent Smiths fight. I�ll Handle Them takes a 17-minute look at the fight that occurs after the freeing of The Keymaker, and The Exiles is a 17-minute piece that focuses on The Merovingian and his cronies. Finishing up this disc is a 26-minute piece involving Enter The Matrix: The Game, the 23 live-action sequences (42 minutes) shown in that game, and a music video for �Sleeping Awake� by P.O.D.. The extra features for The Matrix Revolutions also include another �Philosophers Commentary� and �Critics Commentary� track, along with yet another written introduction by The Wachowski Brothers, featuring the exact same participants in the audio tracks. Along with another �In-Movie Experience� we get another look Behind The Matrix, which this time gives us a 90-minute look behind-the-scenes. There�s also pieces focusing on the Crew (25 minutes), Hel (27 minutes), the Super Burly Brawl (16 minutes), a New Blue World (26 minutes), the Siege (40 minutes), and the Aftermath (39 minutes). We finish things up with the trailer for The Matrix Revolutions and six TV spots for the film. A huge extra feature in its own right, The Animatrix is a collection of short animated films that bridged the gap between many of the subplots from all of the Matrix movies. Originally released as a separate video release, having it in this whopping collection is a huge bonus. There are even extra features on this disc, including commentary tracks for The Second Renaissance Part I & II, Program, and World Record. There�s also 55 minutes of making-of segments for the short films, along with the 22-minute Scrolls to Screen: The History and Culture of Anime, and text-based biographies on the main folks responsible for The Animatrix. If you thought this was more than enough extras and that we were through, you are mistaken, as this set also includes The Matrix Experience: 2-Disc Databank. Unfortunately, both of these discs are standard definition DVDs, but there�s still some great footage here. The first disc is a flipper, and Side A has The Burly Man Chronicles, a 94-minute documentary that is essentially a production diary chronicling the making of all three films. There�s a seamless branching option available for this piece, but if you�d rather watch that footage separately, you can choose to Follow The White Rabbit, which makes all of this material easily available. Side B of this disc gives us Return to Source: Philosophy & The Matrix and The Hard Problem: The Science Behind the Fiction. Both of these segments are 61 minutes, and they are most effective when viewed together as they provide nice compliments to each other due to their deep, introspective discussions about the themes behind the Matrix films. Disc 2 starts with The Zion Archive, which is basically a collection of art work, storyboards, and concept drawings about anything and everything Matrix-related. The Media of The Matrix is a collection of trailers, music videos, and TV Spots for the three films, and Rave Reel is nine minutes of test footage from the trilogy including some very cool early CGI-work. Finally, there�s a preview of an online game based on the movies. Sure all three movies have been released a few times on various home video formats, but fans of the Matrix films finally have the one box set they should own. 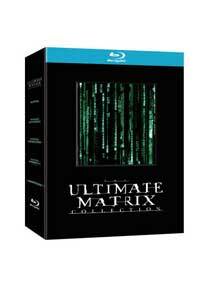 Warner�s The Ultimate Matrix Collection is an amazing collection of anything and everything Matrix buffs could ever hope to own. Along with the dearth of behind-the-scenes features, we get the films looking and sounding the best they ever have and possibly ever will.